If you believe the Internet reports on Black Friday and Cyber Monday, the economy is making a comeback. And perhaps it is. With Americans spending record amounts of money in the first few days of the unofficial start to the holiday gift-buying season, it’s safe to wager (or is it?) that 2012 holds promise for our pockets. Right now, however, it’s still 2011 — a year marred by tumultuous stock markets, a social movement fueled by economic inequality, and an unemployment rate that has remained above 9%. Winter resorts can be costly if you plan to ski the snow-covered slopes, but that’s not the only activity these destinations offer. I’ve found snow tubing — available at many resorts these days — to not only be cheaper and safer than skiing, but also a lot more fun. There’s no skill involved either, so virtually anyone can plop down on the rubber tube and slide down the slick hill until they can’t laugh and smile any longer. I’m not talking about your high-end boutique here — although even those are offering steep discounts on signature services this time of year — but rather an excursion to one of those mammoth complexes that seem to be popping up in every major city lately. For about $40 for the day, you’ll get access to the entire facility, which often includes private baths with steam rooms and saunas, whirlpools, and relaxation areas where you can nap, watch TV, or read. My husband and I try to locate one whenever we’re on vacation, and we’ve visited a local establishment in the dead of winter in the past. After just a couple hours, you’ll feel refreshed and rejuvenated without feeling ripped off. Unless you have kids, chances are you haven’t been to your local museums in quite some time. Do yourself a favor during your staycation and research online what’s new in your area – and not just the art museums, either. I’ve always found the science museums to be loads of fun, even as an adult. Of course, I don’t have to tell you to also check to see which days have free admission before you plan your trip. No sense in paying for something you really don’t have to. If I were planning a movie marathon with friends, I would probably screen the entire “Harry Potter” series since the final film was recently released on DVD — but that’s just me. If this idea appeals to you, but you’re not a fan of witchcraft and wizardry, here’s another way to schedule a movie marathon — depending on how many friends you’re inviting, suggest that each person choose their favorite movie to bring. This is a great way to ensure that there’s at least one flick in the bunch that every one wants to see, and it’s also a great way to find out something you might not have known about your friends before and enjoy a movie that you may never have heard of. There are tons of craft projects that I think about doing throughout the year, but then I get too busy. Don’t put yours off any longer. If you have a few hours to a few days to spare, choose an activity that gets your creative juices flowing. Maybe it’s something simple like making a gift for an upcoming special occasion or perhaps it’s a larger undertaking like painting a mural on a wall in your home. Whatever it is, don’t let time prohibit you; set some aside to express yourself creatively. This sounds expensive, but it doesn’t have to be if you plan ahead. Identify a few restaurants you’ve been dying to try and schedule an eating and drinking tour. I would recommend going during lunch hours, since many places have specials and the prices are generally lower midday anyway. If you’re really thrifty, score deals on Restaurant.com or a daily deal site that will let you eat and drink for a fraction of the price — which is even better when split with friends. I love to cook, but most of my cookbooks collect dust on a shelf in my kitchen. When I’m in a hurry — and that’s often — I either wing it or look up a recipe online. This winter, do it the old-fashioned way. Crack open a book, browse the recipes, and choose something that takes a bit of time and effort. Ring in the New Year with a new home — or at least one that looks like it. Move the couch to another wall; change up the position of your art; hang up new pieces and remove some of the old; and reposition rugs, lamps, and knick-knacks. You’ll be surprised at how refreshed you’re home will feel with a few simple changes. Most people head to wineries during the spring, summer, and fall — which is why winter is the best time for you to take a trip. A thinner crowd means a more relaxed tasting. Pack a picnic — some grapes, cheese, maybe a Thermos of soup, and fresh bread — and plan an afternoon tasting the fruits of nature’s labor. Last year I was away in Miami on vacation, so I wasn’t able to partake in my annual ritual of scouring Target for their post-holiday sales. Totally heartbreaking. I love going right after New Year’s to score the 90% off deals on Christmas décor, wrapping paper, lights, and more. By the time it reaches 90% off, the lot is totally picked through, but beggars can’t be choosy. I’m always happy with my purchases, especially since I save a ton of cash. Bus fare is cheap these days. For instance, I travel from my home in New York City to visit family and friends in Baltimore for less than $40 round trip. That’s a steal! You don’t have to go far during your staycation (because that defeats the whole purpose), so pick a place less than two hours away from your home and take a day trip. Do your research before you get there so you can identify restaurants and shops that you don’t want to miss. Don’t forget to pack your computer, either. Many bus lines featured onboard Wi-Fi nowadays, so you can pop a DVD into your computer and cozy up the entire ride there and back. Whether you prefer books on tape, books on your tablet, or those paper things that line the shelves of the library, set aside a few hours — or even a whole day — to get whisked away in a story or two. Who doesn’t love a good sleepover? In the winter, we occasionally invite friends over for a night of movies, games, food, drinks, and other fun in our pajamas. We have a guest bedroom so we allow them to sleep there, but even a pullout is great to pile up on and talk the night away. We even invite over their dog, if they have one, so ours has company while the adults are kicking back. What’s great about thrift shopping right after the holidays is that a lot of people have cleaned out their closets and donated their old clothes and accessories to make room for the new items they received as gifts. Make a run to the local thrift or vintage shop (and check to see what days offer discounts first) and browse the aisles for an hour or two to find the perfect pieces you never knew you wanted. 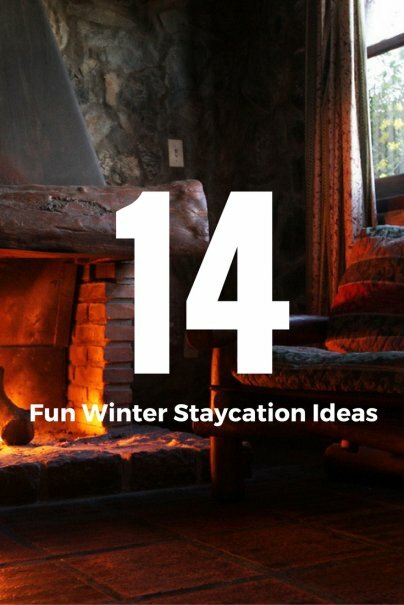 Have other fun winter staycation ideas? Let me know in the comments below. These are some great suggestions to keep the winter both frugal and fun! I love the idea of the spa, I think I am going to start making plans for that one soon. One thing I always love to do in the winter is find a good ice skating rink for a day. We drive up to Flagstaff from Phoenix and play in the snow with out daughter. Lots of fun and inexpensive! Great ideas! I especially like the sleepover idea. Fun with friends is always a good time. We've started having informal parties around the Academy Awards and the Golden Globes for this reason. Everyone brings a snack. We print off "ballot" sheets and go to town. Fun. Awesome suggestions. I think the best thing about staycations is that it's affordable to do them more often. Here's to more fun weekends at home! Snow tubing rocks! Particularly when you have a good tube. Great post. Thanks!